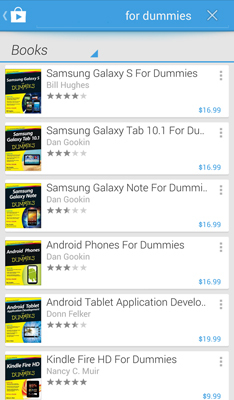 You can buy those things you love for your Galaxy S6 straight from the Google Play Store. Most people are fans of e-commerce, which is a fancy way of saying going shopping on the Internet. Often on the Internet you can find a greater selection of things you want than in most stores in your neighborhood. You can also find lower prices. Tap the Play Store icon from your Home screen. 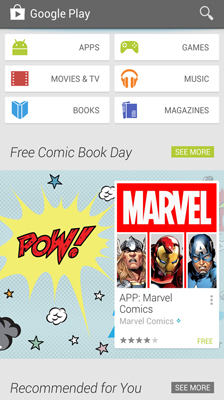 Tap the Books option from the Play Store Home screen. The Play Store Home screen makes lots of suggestions. To search for a particular item, tap the magnifying glass icon in the upper right corner. 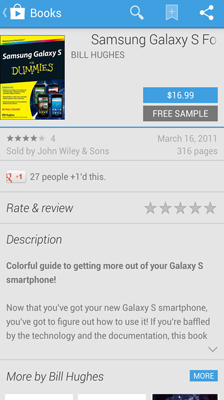 If you know which For Dummies book you want, you can also say the complete name, such as Samsung Galaxy S6 For Dummies. When ready, tap the magnifying glass icon. This brings up your search results. Click the thumbnail of the item you want to select it. When you are ready to purchase, tap the blue box with the price. If you have a credit card on file with Google through your Gmail account, it verifies that you indeed want to purchase the item.